Know any of your buddies that bought an MC and realized they should've bought a Malibu? How much you wanna bet it's not as simple as telling your dealer, " I rode the new 23 LSV and it was a better wave." And they cut you check? It's a pretty bold claim, and I would have to believe there is some fine print that follows it. That being said, I wanna try one. I love to know for my own self if things are all hype or can back up what they claim. Think it's better than my two four? old and wise enough to know better. They are banking on the fact that anyone that spends that kind of money on a brand new MC would never admit that it did not have the best surfwake ever even if it did not. I think its a safe bet on their part. I think that's a pretty respectable offer. Didn't read the fine print but the bullit points listed above would give me confidence if I knew that going into the purchase. Will someone test the claim and throw down some cash already....? special order you MC.. return it and you need to buy your next boat from dealer stock.... pretty narrow options.... and they don't cut you a check for at least 30 days.... miss a step and you have a weekday and a weekend boat. The 30 days starts when you sign the papers. Most people won't even get their new boat within 30 days. This is a marketing ploy IMO....nothing more. How many boats do you think they actually return this year? Ha, I would bet zero Doc. What about the break in? Subtract the break in from your 10 hours and you get, what, a single ride to decide. 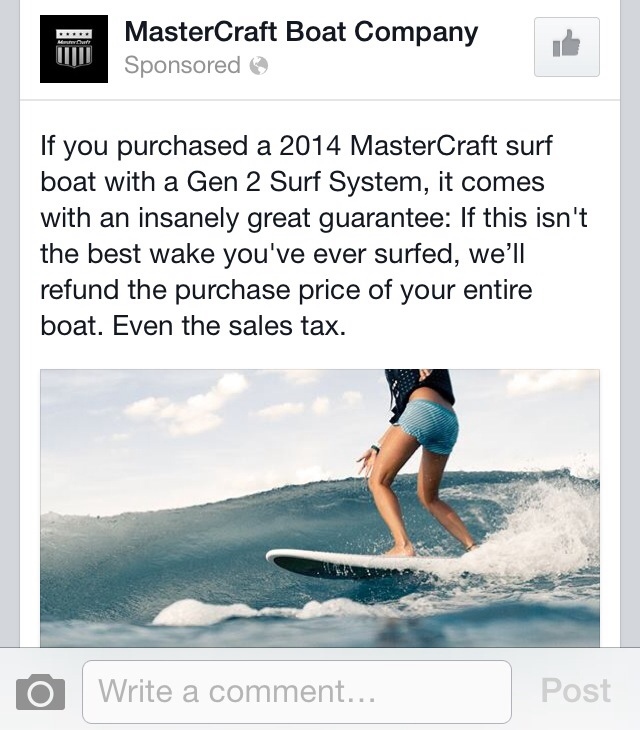 All marketing because if you were going to a dealer to decide on a boat based on the wave, wouldn't they just take you out and show you? Marketing BS once again. Caveat Emptor! Doesn't old just make you wiser???? If we all had Baddog's avatar, she would never let us make a mistake and buy a Mastercraft. Has anyone here actually seen this Gen 2 surf system or surfed behind it? Maybe it is the real deal, I know the X-30 is supposed to be a great surfboat. MC builds some quality boats, love or hate them, this is not there first rodeo. I do like how the surf tabs are different on each side of the boat to counter the prop rotation. At least the offer does give the buyer some options, more so than any other boat manufacturer after you purchase. Follow the steps to a T or you're out tens of thousands of dollars. Kind of reminds me of another MC scam... Cash Rewards. Within 30 days of the return of the MC boat you must have a signed purchase agreement and taxes paid, registered etc.... you are committed to a dealer stock boat for a replacement to make the 30 day window happen. Agree with the previous statements.. the guarantee is so limited and unfeasible it may as well not exist. They way I am reading it is you have the option buy another boat within 2 feet of a COMPETITOR, not just another MC.... am I missing something? No I believe you HAVE to purchase another boat. This ensures that Joe Blow won't buy a MC for a weekend to impress all the socialites then return it. That's a joke. So you have to physically seek out and PURCHASE another boat and rush the marine board to get your registration to you before the 30 days is up. All I can picture is a guy running in slow motion with his reg. stickers in hand to the front of the boat before the clock strikes 12 at midnight of the 30th day. not to mention that the claim is that it's the "best wake you've ever surfed," but you are supposed to make that determination within the first ten hours of operation... seems like poor break in procedure? Oh I know... but it just seems to run counter to Mastercraft's recommended (and insanely long) 50 hour break in period.